While on their way to Xavier’s to be deprogrammed, Rusty and Skids are kidnapped by the Friends of Humanity. With the X-Men away on various missions, and fearing bad publicity for X-Factor, Xavier asks X-Force to rescue the pair. X-Force easily defeat the Friends of Humanity’s men and save Rusty and Skids. Meanwhile, Vanessa agrees to help Domino find X-Force. Val Cooper says the government has a mole inside the Friends of Humanity. I don’t remember if anything ever came of this. Rusty and Skids are two former members of the New Mutants who were brainwashed into joining the Mutant Liberation Front. Since this issue is almost entirely devoted to X-Force rescuing them, you would think that there were future plans for the characters, but they’re barely seen after this. It’s surprising to look back on this issue and remember that I was totally satisfied when I first read it. It’s not that there’s a gaping plot hole, inconsistent characterizations, lazy plot coincidences or anything like that…there’s just no drama whatsoever. In the 20 years I’ve been reading comics, I don’t think I’ve read another superhero comic where the villains offer absolutely no resistance at all. X-Force bursts into the FoH headquarters, smack them around for two panels, and that’s it. No one fights back -- no one has to dodge a laser blast or block a punch or anything. Plus, the FoH goons are just guys in black bodysuits. Can’t they at least rent a mecha-robot or something? It’s amazing that I didn’t pick up on this at all as a thirteen year old. I still think the art’s nice, and that carries a lot in a bland story, but you’d think I would have noticed the world’s dullest climax. Actually, I guess it’s possible that younger readers really do want this type of comic; just a group of supreme heroes who easily beat up on the bad guys without any opposition. X-Force is so awesome the villains can’t even get a punch in! I guess to add some relevance to this issue, Cannonball gives a “why can’t humans and mutants get along?” speech, with a slight twist at the end (acknowledging that humans might have a legitimate reason to fear mutants). The rest of this issue -- the setup, the characterizations, the artwork, the use of past continuity -- is fine, but there’s really nothing that can save such a lackluster climax. After the explosion, Storm uses her powers to blow debris away from civilians, while Bishop discovers Forge and Mystique hidden within a protective dome. The X-Men arrive as Fitzroy emerges from the rubble. His armor is destroyed by Jean Grey’s telekinesis, and a distraught Colossus begins to beat him mercilessly. When the X-Men attempt to restrain him, Colossus sends Archangel through a window before Bishop finally calms him down. Meanwhile, Kitty Pryde arrives at the X-Men’s mansion to visit the dying Illyana. Bishop says that Forge, under the name “Genesis”, created the XSE and “came to power after the ‘Summers Rebellion’”. He later describes Fitzroy as “the son of one of the most powerful members of the Hierarchy”. Fitzroy’s super-powerful armor that killed so many established characters in his first appearance is shattered in one panel by Jean Grey. Why didn’t she do that the first time they met? Not a bad conclusion to a story that’s essentially killing time until the next crossover. 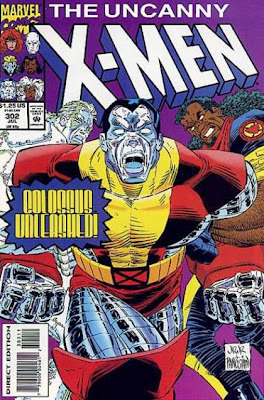 It’s certainly better than Lobdell’s early soap opera issues, and miles ahead of the “Last Morlocks Story.” Aside from providing mindless action, the story also ties in with the ongoing Colossus subplot so it doesn’t come across as just filler. It’s a decent example of a story arc that stands on its own while laying the groundwork for future events. It’s also nice to see the X-Men helping normal people instead of just defending themselves for a change. Looking back on the issues I’ve reviewed so far, “normal people” hardly ever show up (surprising for a series about heroes “fighting to protect a world that fears and hates them”). Fitzroy tortures Selene to gain the attention of the Gamesmaster. He agrees to a meeting of the Upstarts and declares Forge as their next target. Meanwhile, Storm and Bishop travel to meet Forge and give him info on the Legacy Virus. Fitzroy attacks Forge and Mystique in their home, gutting Mystique and destroying Forge’s mechanical leg and hand. Fitzroy’s armor reaches “full neutron charge” and the building explodes. Selene says that she founded the Upstarts in order to shape them into “the next generation of mutant leaders”. It’s the only real origin the Upstarts have received at this point. Fitzroy says that his mother was killed by Bishop’s sister in their timeline. Gamesmaster claims that Forge’s actions during the next twenty-four hours “will directly affect the fate of every homo superior on this planet”. I assume that this is connected to the info he’s receiving on the Legacy Virus (Shi’ar data that Xavier doesn’t fully comprehend), but the story isn’t clear. The original solicitation of this issue (or the abridged version reprinted in Wizard) reads “Mystique gives Forge over to Fitzroy. Lee Forrester, Magneto's ex-lover, shows up at the X-Men's place.” Clearly not what happens here. Selene’s body is being “ripped to shreds one instant, back to form the next” by Fitzroy’s future technology. I wasn’t even slightly disturbed by this scene when I first read it, but it apparently offended quite a few people. Years later, it was still being referenced as an example of the horrible treatment of women in comics (I remember people bringing this up again when the “Women in Refrigerators” list came out). Looking back on it, it still seems pretty tame to me. There’s no blood, and Romita’s art makes the concept seem more like science fiction than realistic physical torture. It’s another one of Lobdell’s more straightforward, action-heavy issues. In comparison to the continuity muddle going on UXM’s sister title at this time, it’s a nice break. The heavy action is a good fit for Romita, especially during this stage when he was drawing everything as large as he possibly could. If you compare Forge’s first appearance (also drawn by Romita), to the bulky he-man in this issue, the difference is staggering. If this were one of Lobdell’s slow, chatty issues, this style wouldn’t fit at all, but it works for an issue mainly devoted to explosions and punching. While reading this issue, it occurred to me for the first time that the Upstarts might have had potential as real adversaries. Their motivation is no worse than Arcade’s, I guess, and their competition provides the impetus for the X-Men to get involved with the action, rather than just hanging around their nice house. If their debut in the early Lee/Portacio issues weren’t such a train wreck, I might have been more open to the concept. Of course, the creators themselves seemed to be losing interest in the idea at this point, as the Upstarts are forgotten about few months after this storyline. Rogue battles Sauron while Wolverine claws his way out of a pit of dinosaurs. After reaching the surface, Wolverine threatens to kill Sauron, but Rogue convinces him that Sauron needs help. They travel back to Brainchild’s citadel, where Rogue plans to use his Genetic Transformer to revert Sauron back into Karl Lykos. 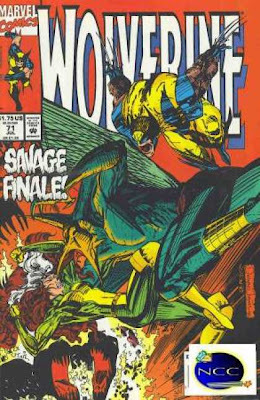 Sauron convinces Wolverine that he has his own right to live and belongs in the Savage Land. Wolverine reluctantly lets him go, as Storm and Bishop arrive with Jubilee. The final two panels have been re-lettered to give Wolverine ominous dialogue about Magneto’s return. The Savage Land arc concludes with Turner’s weakest art to date. Wolverine versus a crowd of dinosaurs should, at the very least, be interesting to look at. Instead, it’s unfocused, ugly, and really just boring. Hama’s story does offer two redeeming moments, though. The first is Sauron’s justification for his own existence, essentially saying that turning him into Karl Lykos is just as bad as forcing Karl Lykos to be Sauron. If the X-Men force Sauron to be Lykos, where do they draw the line? What are they going to force Lykos to be? It’s an interesting idea that can only work in a Savage Land story (given that Sauron really does belong there, so the X-Men aren’t just setting him free in New York City). The issue’s other redeeming scene is on the last page, where we learn that the Savage Land natives had the same initial impression of Jubilee that I did. As the conclusion to a three-part story, though, it’s definitely a disappointment. In Alaska, Mr. Sinister tells Cyclops that he accidentally released Stryfe’s deadly virus. The Dark Riders suddenly appear, eager to test Cyclops. Sinister fights them off, and tells them that Cyclops is not to be killed, but he doesn’t mind if he’s “roughed up”. After a brief battle, the Dark Riders leave. In Japan, Nyoirin tells the X-Men that Kwannon and Revanche possess one-half of each other’s soul. He also informs the X-Men about Matsuo and Shinobi Shaw’s connection to the Upstarts. Gambit and Beast warn Shaw that the X-Men are now watching the Upstarts, while Psylocke and Revanche confront Matsuo. This is the beginning of the infamous “Third Summers Brother” mystery. Sinister refers to Cyclops’ “brothers” and then corrects himself, saying that he only meant Alex. Even though this set off ten years worth of debate amongst fans, Cyclops just shrugs it off in this issue. Cyclops’ optic blasts apparently have no effect on Sinister. Sinister says that his death during Inferno was only a ruse. The Dark Riders tell Cyclops that when the “the battle for ascension of the High Lord commences…you will be at the forefront of the killing fields.” The Dark Riders also tell Cyclops that they knew that infecting his son would become the catalyst for this upcoming war. When Cyclops asks Sinister if Stryfe is his son on page four, Sinister’s response is “Perhaps. Who can say?” This word balloon has obviously been re-lettered. I wonder if Marvel still wanted the Cyclops/Stryfe connection to be ambiguous, although you have to wonder why at this point. The Kwannon storyline belatedly reaches something of a conclusion, as Nyoirin finally just spells out Psylocke’s new status quo (in just a few panels, making this four issue storyline seem even more protracted). I can see what Nicieza was going for, and it could’ve provided a clean way to revert Psylocke back to her original body, but the entire storyline was needlessly drawn out and often just outright confusing. Not only were these issues a little dense on their own, but they're built on some obvious continuity mistakes. For a storyline that’s all about the X-Men’s past continuity, that’s a problem. Instead of just killing of Revanche at the end of this arc (which happens a year later), I really think Psylocke should have just returned to her original body. It would’ve put the ninja era behind her, and perhaps made it easier for everyone to forget about the Kwannon/Revanche mess. Unfortunately, the X-office’s attempt to re-energize Psylocke would just result in her getting mysterious powers that no one cared about. The conclusion to the Kwannon storyline only takes a few pages, however, as most of the issue focuses on Cyclops. In terms of advancing any ongoing storylines, not much happens, but Kubert does a decent job on the pointless fight scenes. The Dark Riders really have a ridiculous motivation, but I guess it’s enough to justify a few pages of action (I remember thinking that they looked pretty cool as a kid, too). They’re really just a distraction in this issue, though. After the events of the previous storylines, a lot could’ve been done with Cyclops in this issue, but the opportunity’s wasted. Nicieza’s purple prose also returns on the last page, offering this gem: “The pain and sadness wash over him, warming him like a smooth balm. He’s come to embrace them both – to depend on them – to need them…” Yeah, Cyclops. I hate it when I have to turn to my sadness to warm me like a smoothing balm, too. Rogue escapes from Brainchild, while Jubilee lands on top of a pterosaur and faces a challenge from its owner. She defeats him in combat and flies down to save his life, earning her the respect of the Savage Land natives. Wolverine continues to fight Sauron and his followers. He falls into a chasm and Sauron sends an army of dinosaurs after him. Did you know that May 1993 was Dragon Month? There’s not much to say about this one. Wolverine continues to fight Sauron while Rogue and Jubilee escape the bad guys in rather obvious ways. Wolverine versus Sauron could be an interesting fight, but the art is so murky it’s hard to really care. Wolverine fighting an brigade of dinosaurs should be fun, but you have to wait until next issue to see it. This arc would’ve worked better as a two-parter. In honor of Christmas, enjoy this holiday classic, sure to join the ranks of "A Charlie Brown Christmas" and that Pac-Man Christmas special -- episode 57 of the '90s X-Men cartoon, "Have Yourself A Morlock Little X-Mas". After leaving the Savage Land, Cyclops, Storm, and Professor Xavier’s plane is attacked in the arctic cold. After surviving a crash landing, Xavier senses another presence in the night and leaves on an ATV to investigate. When Cyclops and Storm search for him, they’re ambushed by Siena Blaze. Xavier returns and the three X-Men combine their powers and force Siena Blaze to teleport away. Xavier reveals to the X-Men that a mystery man saved his life and gave him shelter in his citadel during the night. Professor Xavier claims that Cyclops has never called him Charles, although this actually isn’t true. Cyclops is even shown to be physically unable to say the word “Charles”, tripping up over it and giving up. I get the point Lobdell is making, but this is absurd. The mystery man who saves Xavier’s life is Magneto. On page 19, after Ka-Zar asks Cyclops if he’ll make an “honest woman” out of Jean, there’s an added word balloon questioning this figure of speech. All of the dialogue on page 38 has been re-lettered. The dialogue as published has Storm pining away for Forge. Just looking at the art, Storm nestles up with Cyclops in an arguably romantic embrace. Just to speculate, it’s possible that the original idea was that the characters expected to die that night and have a “last night on earth” fling. If that’s true, I can see why the creators didn’t go through with it, but it would’ve been interesting. 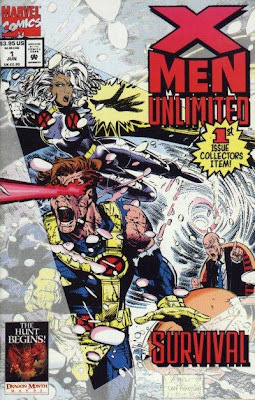 This is the debut issue of X-Men Unlimited, the title that went on to symbolize all that is wrong in superfluous X-spinoffs. As I believe Paul O’Brien pointed out, the last time this title was cancelled, literally no one online seemed to notice. The Unlimited line of titles began in 1993 as an attempt to feed even more product to a crazed speculator market. Each group of Marvel titles received their own quarterly Unlimited (even the “Midnight Sons” books), but only the Spider-Man and X-Men titles survived for more than a few years. 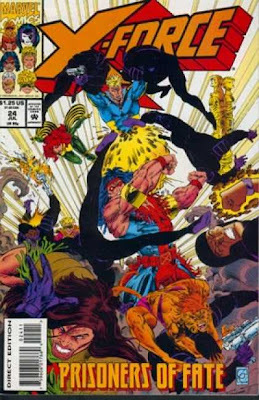 The original plan was for every issue of this quarterly series to be a major event; which lasted for about four issues (issue one introduces the “major villain” Siena Blaze, issue two is the return of Magneto, issue three has Sabretooth “joining” the X-Men, and issue four is the origin of Nightcrawler). By the fifth issue, the title devolved into X-Men Quarterly Inventory Stories, a reputation it never shook. After this title was around for a year so, you would think that Marvel would’ve realized that it was hurting the brand identity of the X-line and done something about it, but it limped along in various incarnations until 2006, finally dying out as a try-out title for new creators. Looking back on what duds Siena Blaze and X-Men Unlimited turned out to be, it’s tempting to totally dismiss this issue, but it has its moments. Chris Bachalo does his first work for the X-office, combining his own idiosyncratic style with the more mainstream look of the early ‘90s X-titles. You can see elements of what’s to come in Generation X, but in some places his art is almost unrecognizable. It’s a good-looking issue, especially when you consider how awful most double-sized comics look. The premise of the story, the three leaders of the X-Men fighting against the elements, is solid even if the master villain turns out to be a joke. Scott Lobdell obviously enjoys writing Xavier, coming up with some creative uses of his powers. It’s refreshing to read a comic that presents Xavier as a sincere, caring father figure, and not a secretive, manipulative, amoral creep. I was never a huge fan of Xavier, but even I was disturbed by the X-office’s recent attempts to darken the character (did anyone think the “Dangerous” arc in Astonishing was a good idea?). The comic’s major flaw is obvious to fans of this era – Siena Blaze, a poorly conceived villain who thankfully disappeared not long after this issue was released. Blaze has the vaguely defined ability to disrupt the Earth’s electromagnetic spectrum, and every time she uses her power, there’s a chance she’ll destroy Earth’s ecosystem. Since everyone knows this will never happen, it’s a hollow threat. Aside from that, her motivation is simply that she’s a spoiled brat and decided to join the Upstarts for kicks. These aren’t the makings of a major villain. Thankfully, her confrontation with the X-Men is brief, and most of the issue simply focuses on the X-Men surviving a plane crash in the elements of Antarctica. Overall, it’s not that bad. If X-Men Unlimited had maintained even this level of quality, maybe people would have fonder memories of the title. Induction in the Savage Land! Wolverine, Rogue, and Jubilee are sent to the Savage Land to investigate rumors of Magneto’s return. Jubilee is kidnapped by a native flying a pterosaur while Wolverine and Rogue are searching for clues. 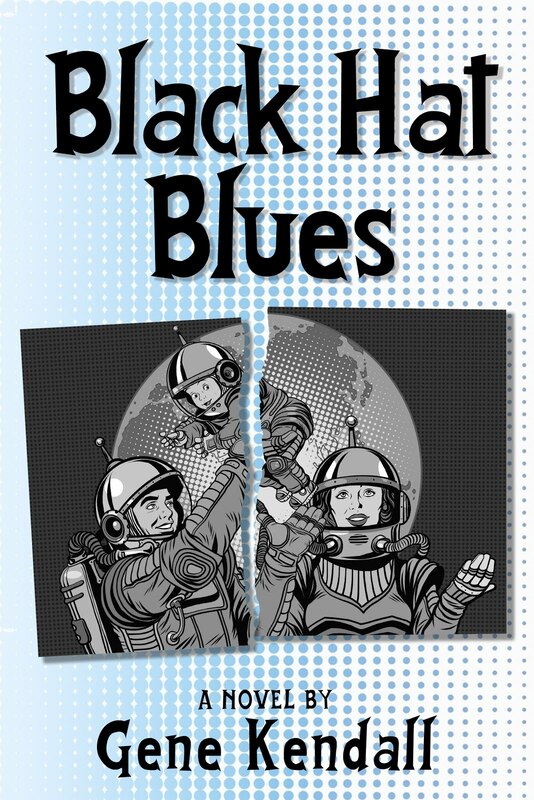 While Rogue investigates magnetic anomalies, she’s kidnapped by Brainchild and Gaza. 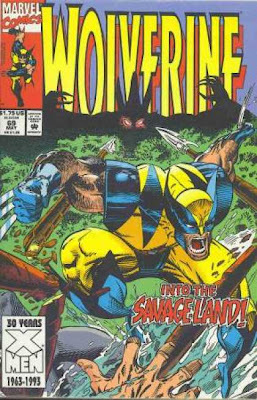 Wolverine follows a group of Savage Land Mutates and natives to their temple, where he learns that Sauron is their new master. In a Bullpen Bulletins cartoon, Tom DeFalco is badly injured after dancing near Wolverine when “some grunge rock” starts playing. Starting with this issue, I began buying Wolverine on a monthly basis. Seeing some of the X-Men guest star and knowing that the title would be playing a role in the upcoming crossover lead me to believe that I wasn’t a real X-completist unless I was buying this title (it would be a few more months before I would feel this way about Excalibur, but I never felt bad about missing the Wolverine stories in Marvel Comics Presents). Even though Wolverine’s memories were unlocked in the previous issue, the event is only mentioned in passing in one panel. Rather than being a logical follow-up to this title’s ongoing stories, this issue feels like it could’ve been a typical issue of X-Men. That doesn’t mean it’s a bad comic, it’s an average straightforward action issue, but I don’t think it’s what regular readers of this series wanted. The two approaches to franchise titles seem to be “make them all the same” or “make them all extremely different”. It seems like Marvel decided to go with the first option during this era. Wolverine starts hanging out with the X-Men more often, a more serious Excalibur moves to Muir Island and stops meeting so many Marvel UK characters, and X-Factor drops the humor and becomes the X-Men with government ID badges. And they all get together each year for foil-enhanced, die-cut, holographic crossover adventures. For some reason, this story goes out of its way not to mention Magneto by name. This trick is also used during Magneto’s cameo in X-Men Unlimited #1. I’m not sure why exactly the creators are so cryptic about this, especially since Marvel’s promotion machine was already hyping his return in the “Fatal Attractions” crossover. Hama does play on this to reveal that Sauron, not Magneto, is the Mutate’s secret master at the end, but it’s still mildly annoying that no one will say the name of the character he’s trying to find. Dwayne Turner’s art is vintage 1993, but he’s not the worst fill-in guy from this era. Most of his storytelling is fine, except for a confusing sequence on page six where Wolverine is supposedly stabbing a dinosaur in the eye, but it’s hard to tell. Rob Liefeld would be proud of Sauron’s disappearing feet on page thirty, too. I don’t care for his caveman rendition of Wolverine, but I kind of like his cartoonish version of Jubilee. I don’t really know why Jubilee is in this story, but her thoughts on the Dickens novel “David Copperfield” are funny. The X-Men defeat the Silver Samurai and discover Nyoirin’s diary behind the painting of Psylocke. According to the diary (and Psylocke’s memories unlocked by Revanche) after Betsy Braddock emerged from the Siege Perilous, Nyoirin’s assassin and lover Kwannon discovered her comatose body and reached out to her. When they touched, their consciousnesses switched. 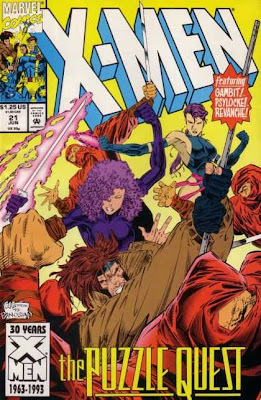 Revanche claims that Kwannon assumed Psylocke’s identity and joined the X-Men as a sleeper agent for the Hand. Nyoirin recovered Braddock from a sanitarium and helped her regain her memory while training her to become his new assassin, Revanche. Silver Samurai re-appears with Nyoirin, who says that both Revanche and Psylocke are actually who they claim to be. Meanwhile, Cyclops discovers that his grandparents’ neighbor is actually Mr. Sinister. Gambit and Silver Samurai already know each other, so Silver Samurai joins the “Established X-character that already knows Gambit” list with Frenzy, Sabretooth, Yukio, the Maruaders, and Mr. Sinister. It’s slightly ridiculous. For the first time, it’s outright stated (by Cyclops) that Nathan Summers is Stryfe. This was very heavily implied throughout the X-Cutioner’s Song crossover, but for some reason never explicitly stated. 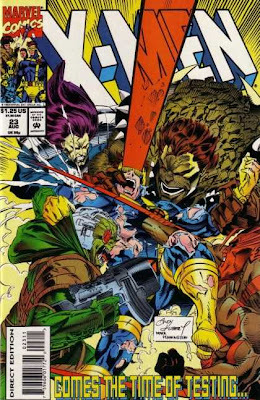 At this point, Stryfe was supposed to be Cyclops’ child and Cable was the clone, which is probably why Cable is barely mentioned in this conversation. This is the first time Mr. Sinister is seen using his “Milbury” alias. The flashback of Psylocke emerging from the Siege Perilous directly contradicts all of the issues actually involving the Siege Perilous. Like all of the other X-Men, she emerged naked, physically healthy but with amnesia. 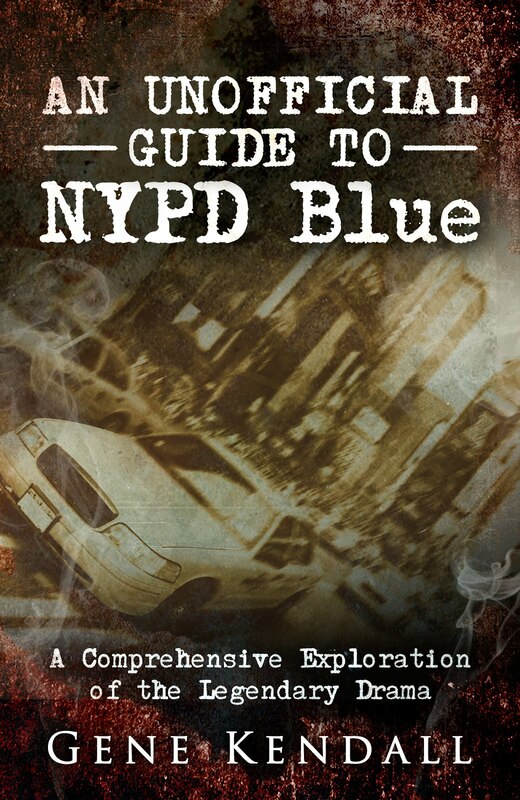 This story has her coming out in her body armor, “her mind fractured, her body battered raw”. Later stories establish that Nyoirin’s diary lied, and that Kwannon used her psychic powers to confuse the X-Men. There’s a sixteen-page insert promoting the X-Men/Avengers 30th anniversary specials. Lots of projects are hyped, and I don’t think some of them were actually released (including one-shots devoted to Sauron and the Technet, for some reason). Generation X is announced, complete with its final logo, over a year before the series debuts. The insert repeatedly states that Magneto is returning, even in a section listing the contest rules for a Sega Genesis promotion. This is typical of comics from this era, as comic companies were obviously more interesting in pumping up pre-orders than in surprising readers. This is the quintessential confusing, nonsensical, continuity-heavy X-Men story. Just to make things more confusing, a lot of the continuity in this issue isn’t even right, so a follow-up arc appears a year later to try and clear things up again. Aside from that, concepts like the Siege Perilous are given no explanation at all, making this even more of a mess for casual readers to figure out. 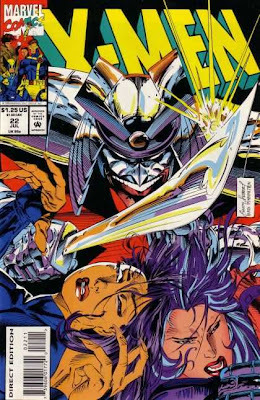 As if the Psylocke/Kwannon/Revanche material isn’t confusing enough, there are also more cryptic scenes with Shinobi Shaw, Matsuo, and the Japanese underworld. Then the Gamesmaster shows up to clutter things up even more. 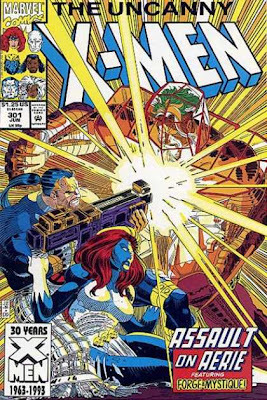 I really wanted to like these issues as a kid, mainly because I thought that my favorite version of Psylocke would be coming back, but I remember just being disappointed by the whole thing. The Caucasian Betsy Braddock, now calling herself Revanche, accuses Psylocke of secretly being an agent of the Japanese crimelord Nyoirin. Wolverine’s enhanced senses cannot determine if Psylocke or Revanche is the real Betsy Braddock, and Psylocke refuses an extensive telepathic scan from Professor X. The X-Men decide to travel to Nyoirin’s home in Japan, where Revanche claims she was held captive. In Japan, Nyoirin makes a deal with Shinobi Shaw to kill the X-Men if Shaw supports his efforts to control Clan Yashida. Later, Matsuo tells Shaw that the Gamemaster has declared Psylocke off-limits to him so that Matsuo can continue his plans for her. The X-Men fight through Nyoirin’s defenses and discover a suggestive painting of Psylocke called “Kwannon in Repose”. The Silver Samurai appears, claiming that he must kill the X-Men to restore his family’s honor. Meanwhile, the Dark Riders continue to eliminate weak mutants by apparently killing Mesmero and fellow member Psynapse. Seattle is referred to as the “grunge-metal capital of the world”. The Kwannon/Revanche storyline continues, and is complicated even more by throwing in the Upstarts competition and Clan Yashida politics. There’s a lot of continuity here, and things are only going to get more confusing before the story’s over. Some of the characters, like Matsuo, aren’t clearly introduced at all. 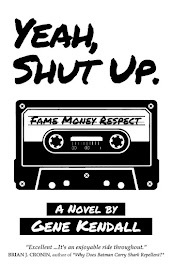 Bringing back Matsuo and referencing the Upstarts competition also reminds me that Matsuo and Fenris were members of the Upstarts during an early storyline in this title, but were soon dropped without explanation. To make things more confusing, Peterson’s art makes it almost impossible to tell Matsuo and Shinobi Shaw apart. Just like Gambit's X-traitor storyline, this is a story that would only last a few pages if Xavier or Jean Grey would just use their mutant powers. Nicieza tries to cover for this, but I find it hard to believe that Xavier would refuse to psi-scan Psylocke just because she told him she didn’t want to be “violated”. Someone in her original body just appeared accusing her of being a traitor to the team. Wouldn’t the safety of the X-Men be more important than her momentary discomfort? Would this truly "violate" her? And why is another traitor storyline being introduced when the first one still hasn’t gone anywhere? #66 (Hama/Texeira/Biasi/Brosseau/Buccellato) – Professor Xavier tries to remove Wolverine’s memory blocks, but the attempt only drives Wolverine closer to madness. Wolverine convinces himself that it’s 1968 and he’s on a mission to kill a “Terry Adams”. These issues have a dark surreal quality to them that’s really brought to life by Texeira’s ability to alternate between photorealism and Sinkiewicz-style insanity. Hama is also able to make Wolverine’s past as a CIA agent seem like a credible aspect of the character’s history and not just tacked-on backstory. There is some odd continuity, though. In issue #65, John Wraith allows Wolverine to bury Silver Fox as a favor for “Terry Adams’. Wolverine says he doesn’t remember, Wraith says he can’t forget. Just one issue later, Wraith says he doesn’t know anything about Terry Adams, except that the mission was scrubbed. It’s a strange backpedal. And just to nitpick, both 1967 and 1968 are the dates given for Wolverine’s flashback in different parts of the story. #67 (Hama/Texeira/Palmiotti/Brosseau/Buccellato) – Maverick tells the X-Men that “Terry Adams” is a place, not a person. Government operatives couldn’t pronounce the name of the Soviet space station Tyuratam, so they called it “Terry Adams” instead. It’s a nice twist that also reminds me of the turns in Hama’s G. I. Joe stories. There’s an extended sequence with a nearly dead Wolverine crossing the desert that’s fairly disturbing and adds an even darker element to the story. #68 (Hama/Texeira/Biasi/Brosseau/Buccellato) – Wolverine finally remembers that his aborted mission was to kill the Russian astronaut Epsilon Red in 1968. He discovers Epsilon Red and his psychic daughter in present day Tyuratam. Wolverine doesn’t go through with his mission, and Red’s daughter unblocks many of his memories. Marvel made a big deal about Wolverine finally getting his memories back after the House of M event, which lead me to believe that none of the creators involved knew about this storyline. However, this issue is clear that some of Wolverine’s memories are implants on top of implants, and that some of the blocks were placed by his own subconscious and can’t be removed. It’s possible to reconcile both stories. It’s interesting that this is the last time Hama really focused on Wolverine’s past or hidden memories during his run. It seems like this was really his final word on the subject. Today, there’s an entire spinoff dedicated to Wolverine’s secret past! As a finale to this specific storyline, this issue is a little bit of letdown. The story has a long creepy setup, then introduces a super-powered Russian astronaut in a goofy costume, gives the guy a happy ending in space, and then reveals that his pregnant wife was murdered by Sabretooth years ago. All of the Russian super-astronaut stuff seems way out of place with the rest of the arc. 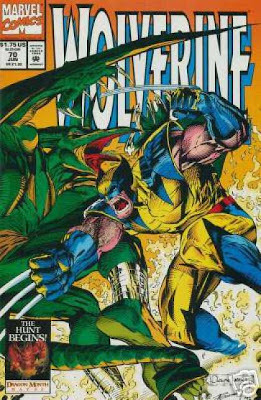 Continuing with my look at the “other” X-books, I’m looking back at the Hama/Texeira issues of Wolverine. I’ve mentioned before that I couldn’t afford every X-book as a kid, so I didn’t read these issues until they were reprinted in the Essentials format years later. I enjoy most of them as an adult, and I think I would’ve been really into them as a kid. 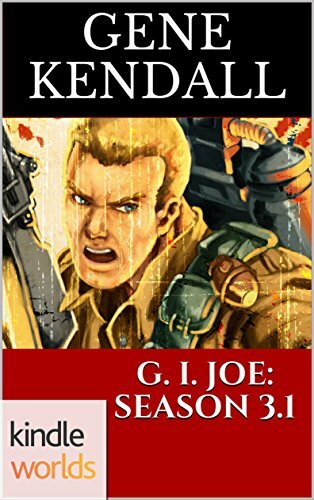 Larry Hama used to have a weak reputation as a writer amongst the net elite (I remember people ridiculing his runs on Generation X and Batman), but that opinion seemed to soften once the ‘80s nostalgia movement began and people took a look back on his G. I. Joe run. I’ve always enjoyed Hama’s work on G. I. Joe, its spinoffs, and other series like Nth Man and Bucky O’Hare. I think he’s a talented writer who doesn’t receive enough credit. His lengthy run on Wolverine was essentially ignored once he left the title, even though Hama probably revealed more of Wolverine’s history than any other writer did. Heck, even the Wolverine Origins series that’s supposed to clear up Wolverine’s continuity has directly contradicted Hama’s stories (though to be fair, this will apparently be addressed in future issues). This storyline is a follow-up to an earlier arc about Wolverine’s past. According to interviews, Hama wasn’t really interested in doing stories about Wolverine’s history, but editor Bob Harras wanted a way to incorporate the popular Weapon X serial into continuity (why exactly he felt it didn’t fit is unclear). Hama’s solution was to reveal that Wolverine had fake memories implanted into his brain, explaining away any conflicting flashback stories. This could’ve been a one-issue continuity patch, but it became the basis for several stories in Hama’s run. Stories about Wolverine’s past have been done to death at this point, but I can remember fans being truly excited about finally “getting answers” in these issues. #61-#63 (Hama/Texeira/Brosseau/Buccellato/Javins) – During this arc, members of the Weapon X project are reunited to discover why one of them, Mastodon, is dying. They discover the psychic responsible for their false memories, Aldo Ferro. Hama’s use of gunplay and military terminology reminds me of his G. I. Joe run, and his handling of Jubilee and Sabretooth is very strong. In issue #63, Hama introduces the idea that Wolverine’s false memory reinforcement is tied into physical pain, referencing “initiation rites of the Mandans and Australian Aborigines”, and “African tribal scarring.” Not really the references you might expect from an early ‘90s X-comic. Texeira’s art is gritty and suitable for this story, but sometimes his anatomy is a little odd (Wolverine has a tiny waist that comes and goes for some reason). #64 (Hama/Pacella/Panosian/Brosseau/Javins/Tinsley) – The arc concludes with this disappointing installment. Most of this issue consists of illusions cast by Ferro (or “Psi-Borg”, his hilarious supervillain name) as rendered by Mark Pacella. As a result, it’s hard to tell what’s going on, as the issue ends with Silver Fox dead (again), and Ferro escaping with Sabretooth. Ferro claims that he drew all of these characters together to learn the secret behind the Weapon X project’s age suppression factor, but it’s unclear if Ferro himself was responsible for Mastodon’s death at the beginning of the story. It’s the type of vague non-answer you often find in the X-books at this time. Hama does reveal that Wolverine and Silver Fox did have a real relationship in their cabin (as Ferro tells Wolverine, he didn’t waste time implanting “smarmy tripe”, he only made up the “bad stuff”), which is the only real highlight of this issue. There’s also a blatant Jim Lee swipe of Sabretooth on page two that’s hard to ignore. #65 (Hama/Texeira/Brosseau/Buccellato/Javins) – Fortunately, the quality improves as Wolverine buries Silver Fox in this issue. Hama’s able to convey Wolverine’s anguish over recent events while at the same time staying true to his “tough guy” persona. Wolverine and Jean Grey have a nice conversation that does a lot to humanize the character, even if it is occasionally interrupted by Wolverine's eyeball popping out. Even though Silver Fox mainly existed as plot device, Hama still gives her an emotional sendoff in the end. One of the best issues of this run. That’s all I’ve got. See you in two weeks.